(Newser) – Over four decades, two Catholic bishops in Pennsylvania covered up the abuse of hundreds of children at the hands of more than 50 religious leaders, according to a grand jury report. A 147-page document notes Joseph Adamec and James Hogan of the Altoona-Johnstown Diocese moved offending priests between parishes, paid off victims, and even threatened them with excommunication, per the Christian Science Monitor. One accused clergyman was moved to a school for boys, per the AP. 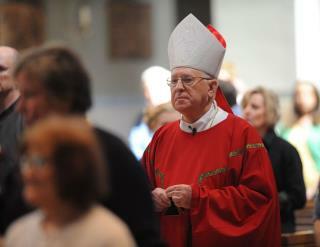 Hogan, who led the diocese from 1966 to 1986, died in 2005; Adamec, his successor who retired in 2011, refused to testify. The report was compiled using secret diocese documents, including some found in a safe, Pennsylvania AG Kathleen Kane tells the Wall Street Journal. No charges have been laid because the statute of limitations has either run out or the alleged abusers have died. If this happens regularly here in the states, why don't we hear about it happening over seas?